When it comes to Christmas markets in Europe, no one does them better than Germany. Which makes sense, since the Germans pretty much invented them. The Christmas market – also known as the Christkindlmarkt (Christ child market) or Weihnachtsmarkt (Christmas Eve market) – is a tradition that began in the German-speaking parts of Europe way back in the Middle Ages. There were special winter markets mentioned way back in the 1300s! The markets celebrate the Christmas season during Advent, the four weeks leading up to the holiday. They're known today for festive stands selling regional treats and crafts, and for exuding all sorts of Christmas-y cheer. Today, cities all across Europe carry on the Christmas market tradition. But I still think Germany does them best. If you're looking for a Christmas market (or 10) to visit in Germany this holiday season, here are some of the oldest, prettiest, and most unique markets to add to your list. And now, on to the best Christmas markets in Germany! The Nuremberg Christkindlesmarkt, or Nuremberg Christmas Market, is arguably Germany's most famous Christmas market. The Christmas market on Nuremberg's Main Market Square can be traced back to documents first mentioning it in the year 1628, but Nurembergers believe it dates back even further. Keeping the tradition is important, and the majority of stalls selling their wares sell things that are all made regionally. Even the wooden stalls themselves are made of regionally sourced spruce, and at least 30 of the wooden huts themselves were originally constructed in 1890. You'll find 180 wooden huts selling everything from the traditional Prune Men that decorate Nurembergers houses at Christmastime to the Original Nuremberger that can only be named as such if they are produced within the city limits and weigh precisely 23 grams. Jennifer and Tim from Luxe Adventure Traveler, Americans that have called Europe home for a decade, recommend trying the GERSTACKER blueberry glühwein. The GERSTACKER stall has been a fixture of the Nuremberg Christkindlesmarkt for more than 35 years, and the blueberry mulled wine is a unique twist on the traditional glühwein. You can also get a fantastic view over the entire Main Market Square by climbing up to the balcony of the Church of Our Lady. Dresden becomes Germany’s so called ‘capital of Christmas’ starting at the end of November and lasting until Christmas Eve. 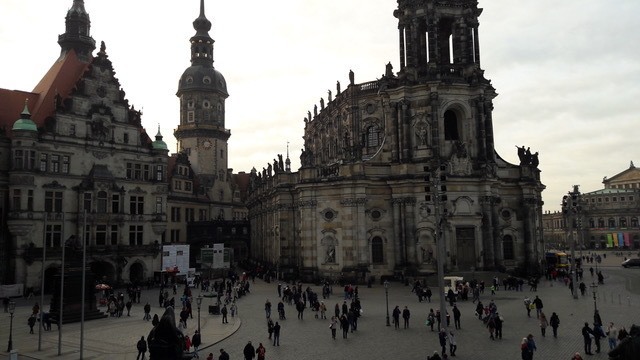 With so much history and Christmas spirit, Dresden is the place to be during Advent. The most famous of Dresden’s Christmas markets is the so called Striezelmarkt. The name comes from the “Striezel,” which is an old name for Christmas stollen bread. The Striezelmarkt is one of the oldest Christmas markets in Germany. Since 1434, this market has spread its beautiful charm every single year over the Altmarkt (old market square in the historic center of Dresden), becoming a big attraction for both locals and tourists alike. At the time when the market was founded, it was actually used as a meat market for only one day, mostly for the people of town to buy their Christmas roast. It didn’t take long until the market grew thanks to salesmen and craftsmen who came from the area around Dresden. Nowadays, you will find around 200 huts and stands from different vendors, featuring everything from wood crafts to local foods. Every year about 2.5 million people come to visit this historical Christmas market and enjoy a hot cup of Glühwein. And of course you will find not only this Christmas market in Dresden. 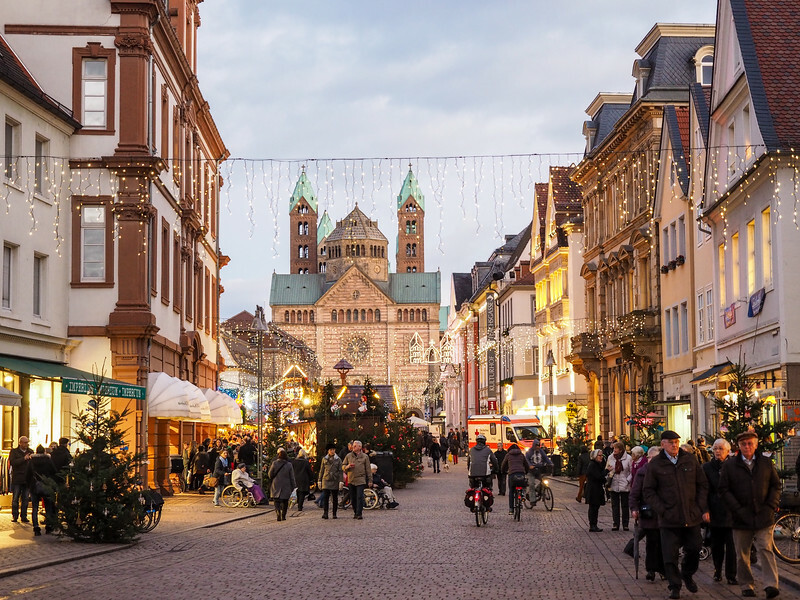 During the Christmas season, there are beautiful markets covering much of the historic center, turning the area from the Altstadt to the Neustadt into a bustling Christmas market quarter. Like many larger cities in Germany, Cologne doesn't host just one Christmas market. Instead, Cologne has up to 8 different Christmas markets each Advent season. Each market has a different vibe or theme – and each one has its own Christmas market mug for you to collect! The oldest Christmas market in Cologne is the Angel's Market, held on the Neumarkt and characterized by lots of twinkle lights and paper stars hanging in the trees. 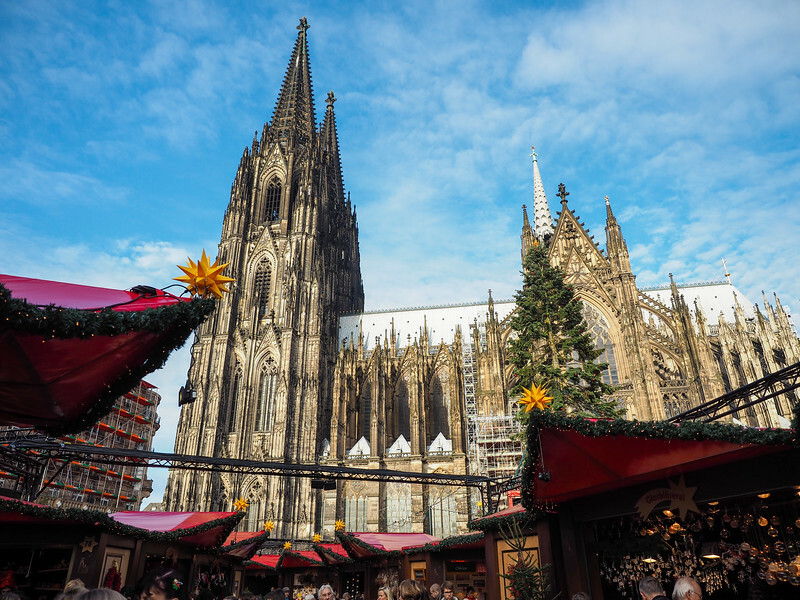 You'll also want to visit the Cathedral Christmas Market, where the colorful stalls are set up right beneath the spire of the UNESCO-recognized Cologne Cathedral. 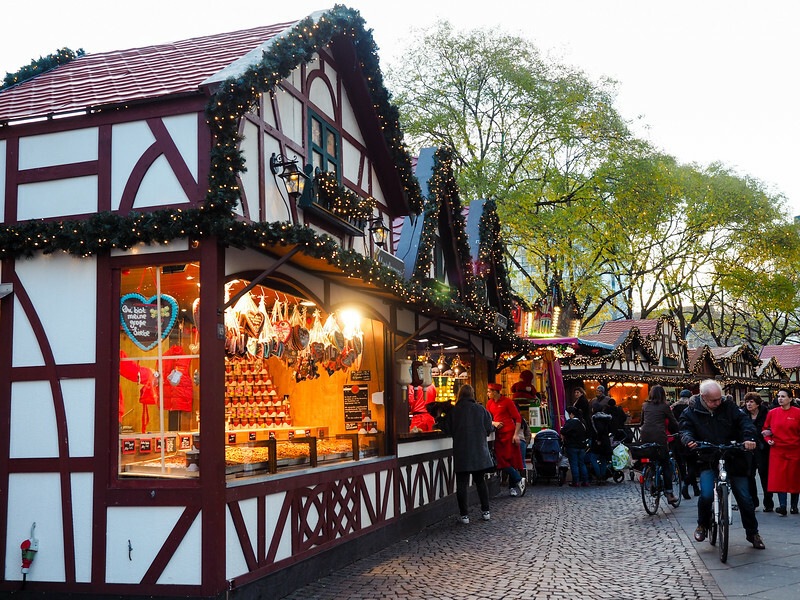 The best Christmas market for families is probably the Altstadt Market (Old Town Market), located on the Alter Markt in front of Cologne's town hall. This market is “run” by the Heinzelmännchen, or house gnomes. You'll find all the usual Christmas market trappings here, from handicrafts to spicy Glühwein, along with toy stands and a puppet theater for the kids. There's also an ice rink here that's fun for the whole family. Hamburg is incredibly festive during the holiday season, and you will find Christmas markets all over the city in December. However, the most iconic one is the market in front of the old city hall. This year, it is expecting almost 3 million visitors, making it one of the biggest Christmas markets in Germany. It is organized by Roncalli and its motto is “Kunst statt Kommerz” – art instead of commerce. While there is plenty to buy at the toy alley, most of the things on offer are real handicrafts instead of plastic stuff, like carved toys from Tirol and other unusual things that make for great presents. Three times per day Santa arrives from the skies on his sleigh and tells the story of Rudolf the reindeer for the children at the market. Another highlight is the Christmas parade that takes place every Saturday until Christmas. Elves, angels, gnomes, and reindeer make their way through the city center, bringing festive cheer to the city. Bremen, Germany is a German fairytale town in northern Germany, a short hour and a half bus or train ride away from Hamburg. Fairytale is no exaggeration: literally, the town is famous for the Brother's Grimm tale The Bremen Town Musicians. Bremen is home to two amazing Christmas Markets. There's a traditional Weihnachtsmarkt held right in the 1,200-year-old Old Town market plaza – a UNESCO World Heritage site – selling treats like Gluhwein (hot mulled wine), Feuerzangenbowle, and Reibekuchen at the foot of the gorgeous, towering Rathaus. The other Christmas Market is the Schlachte-Zauber, a Medieval-themed Christmas Market along the waterfront. The Medieval Christmas Market, complete with pirate ships, shop employees dressed in period costumes, and kitschy booths with theme-appropriate wares like spells and potions ingredients. You'll find classic fare like roasted chestnuts and sweet Eiserpunsch with gingerbread cookies, plus delicious mulled Elvesfire wine. Look for the stand with a wide variety of fruity mulled wine, and order either Elvesfire or Dragonsfire – they’re the best. Other than stuffing your face at Christmas Markets, there are plenty of things to do in Bremen in the winter: be sure to spend a day exploring the hidden alleys in Old Town like the Museen Böttcherstraße and the Schnoor; go chocolate tasting at Hachez Chocolate; and visit the home of Beck's beer. As you explore, keep your eye out for the keys to the city: they're hidden all over town! Berlin is bursting with brilliant Christmas markets. And one you simply must visit is the Christmas market located at Potsdamer Platz (better known as Winterwelt). It’s probably one of the most popular markets in Berlin, with a whopping 2.5 million people visiting a year. And it’s no surprise why. The Potsdamer Platz market is filled with delicious food stalls serving mulled wine, classic Bratwurst, and hot chocolate delights. You’ll not run out of delicious food and drink to try at this market. It’s not all about the food however, Potsdamer Platz also offers a brilliant ice-skating rink to swirl around on. It’s the perfect spot to get into the mood of Christmas, especially since they play Christmas music on a loop. One of my favourite Christmas souvenirs from any Berlin Christmas market is a handmade bauble for the Christmas tree, and this market is bursting with choice. Make sure you look after your baubles on your journey home though – my friend accidentally smashed hers! While many people flock to the major cities like Berlin and Munich for Germany's Christmas markets, I suggest going a little off the beaten path. In the heart of a little town called Kassel you'll find the Kassel Märchenweihnachtsmarkt, a truly magical Christmas market. Kassel is the heart and soul of Germany's fairy tale route. At over 600km long as it runs from Bremen to Hanau, the route pays homage to the iconic Brothers Grimm fables. The Kassel Christmas Market embraces this and chooses a different tale for the theme each year. Will it be Snow White or Cinderella? Maybe it'll be the classic tale of Hanzel and Grettel? You'll just have to attend to find out! Wander the stalls and admire the adorable fairy tale decorations as you indulge in a number of glühwein flavors and incredible eats. As if this wasn't enough to entice you to visit, it's the only Christmas market that is open past December 25th! Last year I went on a road trip trough France and Germany on the hunt for the best Christmas market, and my favorite by far was Rothenburg ob der Tauber. Visiting this little town right in the heart of Germany is like stepping back in time. The old medieval walls still run around the town and all the buildings are ancient, too. Think of the setting of A Christmas Carol from the '60s and you’re just about there. One of my favorite things to do is get lost along the cobble lanes and in the boutique shops. However, no matter where you walk here all streets seem to lead back to the main square, home to arguably the finest Christmas market in Germany. Surrounded by wonky houses, the main square in Rothenburg ob der Tauber has a giant 30-foot Christmas tree at one end with stalls forming a square around it. Like most Germany Christmas markets, expect to find sweet stalls, sausages, gluhwein, and lots of happy faces! Also, if it happens to snow like it did when I was there then it’s even more magical! With its location on the Necker River and its historic castle on the hill, the university town of Heidelberg is magical any time of year. But once the city is decked out in twinkle lights and pine trees, its charm factor goes off the charts. Heidelberg's Christmas market is spread all across the Old Town, with every square filled with wooden huts and the scents of holiday food. The must-visit spot is definitely the skating rink on Karlsplatz, where you can ice skate with a view of Heidelberg Castle. RELATED: Christmas Markets with Viking River Cruises: What’s It Really Like? Leipziger Weihnachtsmarkt has been setting up in the winter in the city of Leipzig since 1458 and stretches through town from the Old Market Square in the city centre. It is huge, with around 250 stalls and lots of attractions, so do allow a few hours to visit. For our kids, the best part was the talking Fairytale Forest. This is adjacent to one of the most beautiful traditional Christmas trees I have ever seen. Don’t get the two mixed up, though, or you’ll be talking to bark and pine needles that won’t answer back. The Finnish Market provided a chance to watch chefs flame-cooking whole salmon next to open fires. Then after visiting the SudTiroler Dorf Market for another slice of Europe, we headed to the Medieval Market, where castle and tavern provided all the Glühwein and entertainment we could drink in. This Christmas market specializes in traditional wooden gifts from Saxony; stallholders can talk you through the fascinating process of how they are made. Music in Leipzig is everywhere, too, so you'll likely find a singing Santa livening up your festive visit. Stuttgarter Weihnachtsmarkt dates back to the 1600s and is famous for being one of the oldest… not only in Germany, but in all of Europe! I’d argue it’s one of the best, too. These days, you’ll find hundreds of beautifully decorated stalls filled with traditional handmade toys, German food, and holiday sweets. Most importantly, you’ll find an abundance of Germany’s signature holiday beverage: Glühwein. The vendors engage in a little friendly competition trying to outdo each other’s elaborate rooftop decorations while choirs, carolers, and live bands entertain visitors with hymns and holiday music. The market runs all day, but becomes especially magical at night when the Christmas lights really become visible. Evening is the best time to visit, when the air is crisp and the market is aglow. There’s just something about bundling up and strolling among the festive stalls with a cup of Glühwein to warm your insides… it evokes all the holiday nostalgia you could ask for! After a marathon of exploring the Christmas Markets of Baden-Württemberg, Germany, last winter, I came away with one clear favorite: the Ludwigsburg Baroque Christmas Market. This charming market is held in the Marktplatz dominated by two Baroque churches on either end of the market square. The Christmas market is a warren of stalls featuring an eclectic assortment of authentic handmade goods. This was one of the few markets that I didn’t spot a single item made in China. From handmade slippers to delicately carved wooden nativities to hand-blown glass tree ornaments, you’re bound to find the perfect gift here; even if it’s for yourself! There are plenty of tasty treats to enjoy including German Christmas Market favorites like bratwurst and mulled wine, but you’ll also find some international delicacies too. I enjoyed a pick-me-up snack of empanadas and falafels. If you need a break from shopping, there’s a merry-go-round and puppet shows for the little ones, or you can take a short walk to the breath-taking Ludwigsburg Residential Palace where you can join one of the many guided tours. Ludwigsburg is just 12km from Stuttgart and is a 15-minute ride on the S-Bahn from the central train station. When we moved to Stuttgart, Germany, we knew that we wanted to visit as many Christmas markets as we possibly could in the few years that we lived in the area. We certainly made our way around Europe, but the one market that we visited over and over was the Esslingen Medieval Christmas Market in Esslingen, Germany. Some of the markets we visited seemed very similar in style with traditional German fare, a few rides for the kids, and lots of different products to purchase. However, Esslingen was special because it combined a beautiful German town dating back to 1000 B.C. with a medieval market that transports you back in time. This market features a kid’s area with old fashioned games, such as a human powered Ferris wheel and swings, as well as games of toss a stone on an egg or shoot an arrow to knock down the castle. You’ll also find a place for kids to dip their own candle in a variety of colors among other crafts. Outside the children’s area, you’ll find entertainment stages with a mix of delights, and an area where you can enjoy a nice hot bath in the middle of the market (with privacy curtains, if you choose). I have to admit that it was tempting to jump into a huge barrel full of steaming hot water on those cold German winter days. There are ample food options to lure you as you wander around, from slow cooked pork to roasted corn and meat pockets. A favorite in our family was the gluhbier, hot spiced beer. I won’t lie, it’s amazing! Enjoy it in a handcrafted pottery mug and if you like the mug, keep it for a nice memory of the market. If not, return it and get your deposit (pfand) back. Munich is the place to be for Christmas in Germany as there are markets spread around town, each one a bit different from the next. The main Christmas market is in Marienplatz, the main town square, beautifully laid out below the towering glockenspiel and town Christmas tree. Stalls line all sides of the square and vendors offer every German craft, food and drink imaginable. Since this is located in the heart of Munich, it is the easiest for tourists to reach and, as such, is the most crowded. We would recommend heading to the nearby Residenz, the former home of Munich royalty. This Christmas market is sheltered from the weather as it sits in a stunning courtyard, providing an intimate atmosphere for revelers. Musicians perform carols, stalls offer up glühwein and holiday treats, and vendors sell everything from candied nuts to paper stars. There are eight other Christmas markets around the city, from the Chinese Tower in the English Garden to the Viktualienmarkt, and each one has something that sets them apart. Go to Munich for the Christmas markets and you won’t be disappointed. One of my favorite Christmas markets in Germany is not a big one – which is exactly what makes it so charming. You can find it in the small Bavarian town of Altötting. This town has been a pilgrimage destination for centuries. The little chapel in the center of the town square houses a statue of the madonna that is said to do wonders for everybody who prays to her. People leave clutches and other paraphernalia that give testimony to her healing powers. There are pilgrimages every year that bring thousands of people on foot to this chapel, which belongs to the Shrines of Europe and ranks in the same league as Fatima, Loreto or Lourdes. Before Christmas, the square turns into a village of wooden stalls, nicely decorated greens, and impressive Christmas trees. You can wander through illuminated walkways and gaze at the Christmas decorations, glass balls for Christmas trees, and nativity scenes that are displayed in many of the stalls. In others you find huge selections of aromatic candles and incense. What I like most, however, is the smell of freshly baked gingerbread, cookies and Christmas Stollen. This is a rich cake with lots of dried fruit that needs weeks to develop its flavor. You have to be patient to really taste its richness. A local speciality is the “Sterntaler,“ a crumpet in the form of a star. These are made by a local baker and filled with all kinds of good things. My favorite is a Sterntaler filled with cherries and liquor. That is the perfect Christmas food for me. Regensburg, nestled in the heart of Bavaria, is no stranger to great fests and markets. Throughout the whole year, you can find traditional German festivals calling crowds from all over. However, it's the city's Christmas Markets that make it truly a must-visit, especially for anyone looking for memorable Christmas Markets. Instead of one, large market, Regensburg has upwards of 6 markets throughout it's picturesque, easy-to-walk streets. The city is extremely easy to get around; you can get from one market to the next in just a matter of minutes. However, each one will be unique and different than the last. At one, you might get the traditional finds of a Christmas market (ornaments, trinkets, ets) but at another it may be a local artisan market with homemade jewelry and pottery. Then you can go to a romantic market set in the middle of a palace, and at another you can overlook the Danube and Dom while petting sheep and drinking a Feuerzangenbowle (mulled wine with a rum soaked sugar cube lit on fire!). No matter which market or how many you choose to go to in Regensburg, one thing is for sure: you'll be in the holiday spirit in no time! 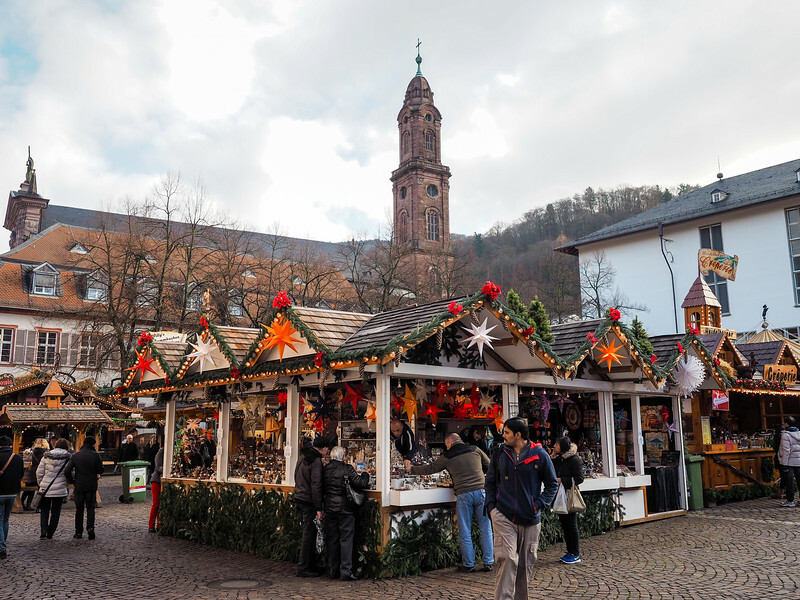 Deep in the Black Forest you'll find the Ravenna Gorge Christmas Market. It is located a 45 minute drive from Freiburg, Germany. What makes this market so unique is not what it sells but its amazing location. Yes, it sells all the usual Christmas fare such as crafts, decorations, food ,and the amazing hot mulled wine. But this market is found in a deep gorge with a train bridge running straight over top. The 130-foot Devils Valley Railway Bridge is a one in a million setting.The bridge is illuminated in Christmas colors such as green and red and blue. Grab a wine and stand by one of the many fire drums to listen to some traditional music and take in this location. It gets cold (I mean very cold), so dress for the occasion. I would think its one of the most unique Christmas markets in all of Europe. Another unique but maybe surprising feature is that this is the only Christmas market I have heard of that charges and entry fee. Bring 3.50 euro in change to get in. Parking is at a premium and can be booked online for this amazing experience. Sometimes it's the smaller Christmas markets that leave an impression on you. This was definitely true in the town of Speyer, an historic city on the Rhine River. The town only has one Christmas market, located on Maximilianstrasse in front of the Old Mint. The Speyer Christmas market is also one of a few that extends into January, meaning you can enjoy it even after the holidays. Berchtesgadener Advent is a small Christmas Market, but what it lacks in size, it makes up for in cheer and conviviality. Set in the German Alps, the town of Berchtesgaden has all the charm you'd expect of a Bavarian village. It’s adjacent to Berchtesgaden National Park, home of the cleanest lake in Germany, Konigsee. The mountainous backdrop alone makes Berchtesgadener Advent worth a visit. In the Market Square (Marktplatz), Christmas booths fill the Old Town. We enjoyed gluhwein, hot cocoa, and all sorts of pastries. Other booths sold holiday gifts and crafts. Our two boys loved wandering through the tree maze and taking a tour of the salt mine. Throughout the Advent season, there was live music and performances, making the spirit of winter come alive. It’s not as big or elaborate as the Christmas Market in nearby Salzburg, but it is cozy and convivial. On Christmas Eve and New Years Day (and other seemingly random times), costumed men shoot black powder guns over the town. It was always surprising and interesting. We didn’t see it, but apparently at a local festival called Trachtenfest, the town blacksmith will challenge you to a drink by dunking his red-hot iron into your beer, daring you to chug the whole thing. The Christmas Market in Goslar is definitely one of the most beautiful Christmas Markets in Germany. Even though the small town near the Harz Mountains in Lower Saxony is not particularly famous throughout Germany, its yearly Christmas Market is truly outstanding and beautiful. With the surrounding half-timbered houses dating back to the middle ages, the Goslar Christmas Market provides a medieval vibe to its visitors. You can also find a lot of medieval-themed dishes such as meat sticks and freshly baked bread. The Christmas Market is small and cute but that doesn’t mean it’s not worth the trip. On the neighboring square, every year an artificial Christmas Forest is built out of real pines. In this little forest, you can find some stalls selling hot beverages and snacks. Obviously, you can’t leave the Goslar Christmas Market (or any German Christmas Market) without a mug of hot Glühwein. If you are not a fan of those, make sure to grab one of the yummy hot chocolates sold near the Market Church instead. The Frankfurt Christmas Market is easily one of the most famous, recognized, and visited in the world. It is so famous that other Christmas markets use its name as a homage to it! As a Frankfurt local, I can confirm that it is just as grand as it is rumored to be, but there is much more to it than meets the eye. The main Frankfurt Christmas market is located at the main square of Frankfurt, Romer, and that is where the notable attractions and performances take place. But, if you peruse Frankfurt's city center a bit, you can find several smaller Christmas markets that only the locals know about. There are even ones on top of buildings overlooking the city! My favorite is the one at Rossmarkt – it's cozy and not quite as crowded as some of the others. If you can't manage to make it to Frankfurt until after Christmas and the main markets are gone, you can head over to Hofheim, where there's a market that stays around until early January. There are sports games, fires, ice skating, and lots of food and drinks. It is a relaxing place to keep the Christmas party going even after the holiday itself. Passau, Germany, is a small town of 50,000 people that comes to life during the holidays. Every year the old town is beautifully decorated for the season as the Passau Christmas market takes place in the Cathedral square in front of the beautiful St. Stephan Cathedral. 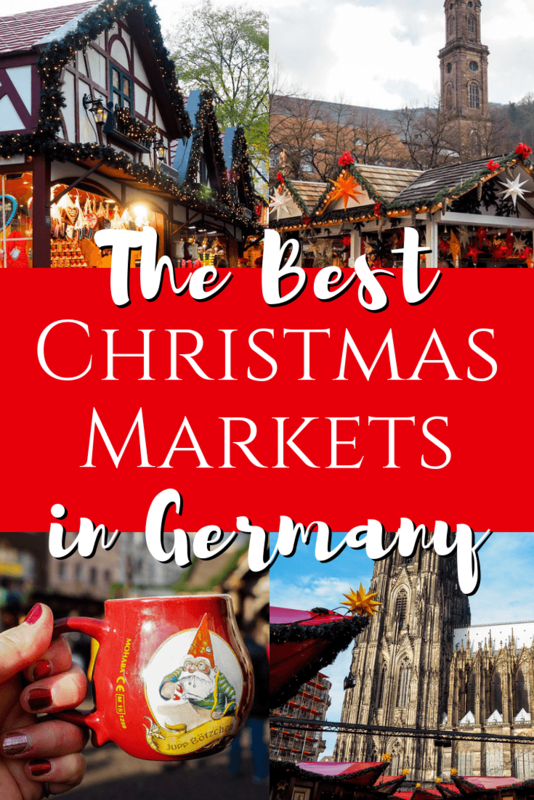 Similar to other German Christmas markets, there are over 70 stalls selling everything from tasty Christmas treats like lebkuchen (gingerbread), to Christmas decorations, beautiful art made by local artisans, and a lot more. There are a few things however that make the Passau Christmas market stand out from all of the rest. The market takes place at the same time as the local handcrafters market, so you can see local artisans creating their beautiful pieces of work right before your eyes. The market also features tasty foods like a 1/2-meter long wurst in a baguette or pretzels cut horizontal and stuffed with tasty cheeses and seasonings. There are flowing chocolate fountains, too, and a lot more. Definitely visit the Passau Christmas market with an empty stomach. 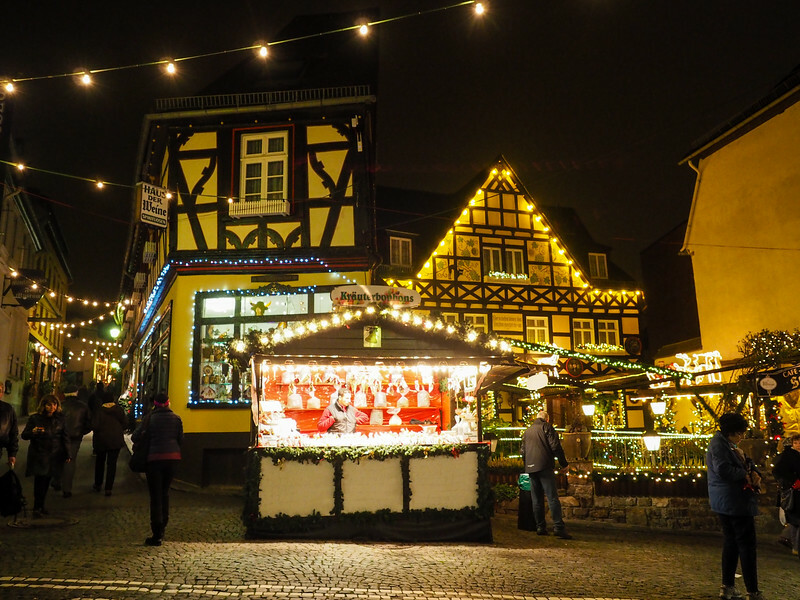 Another small-yet-charming Christmas market to check out in Germany is the market in the town of Rüdesheim am Rhein, a town of less than 10,000 people in the Upper Middle Rhine Valley. Rüdesheim's Christmas market is a popular one for tourists – especially river cruise ship passengers. The town's romantic Drosselgasse (and, really, every available space within the town's old quarter) is filled with stalls selling all sorts of trinkets and treats. You'll want to try the Rüdesheim Coffee, which is made with locally distilled Asbach Uralt Brandy and whipped cream, and also check out the life-size Nativity scene on the market square, which is said to be the biggest in Europe. If you have a choice of when to visit Rüdesheim's Christmas market, I recommend going after dark, when the town just sparkles. Have you ever been to a Christmas market in Germany? If so, which has been your favorite? Such a nice article! I love Christmas markets! Thanks for sharing! I love them, too! I need to do another Christmas market trip one of these years. Hi Amanda, thanks for the lovely collection and inspiration. One of our favorite Christmas markets is in Konstanz at Lake Constance. There are so many amazing Christmas markets to choose from! Wow! What a great post! I lived in Ulm fir a year and a half and it has a nice Christmas market right next to the tallest church in the world! I can still taste the gluwein! That must have been lovely! We have some nice Christmas markets here in the US, but they just aren’t the same since none of our cities have as much history as European ones! Pinned! We’re planning to be living in the UK by next fall so will definitely want to hit up all of the Christmas markets. Can’t wait! German Christmas markets look AMAZING! That will be amazing, and they will be so easy to get to if you’re living in the UK! Beautiful! German Christmas markets are what we think of when it comes to “traditional Christmas.” We’ve been to a few that you mentioned, like Hamburg and Bremen, which are incredible! Another one we’d add is Celle, a small city about an hour train ride or so from Hanover. It’s a small city but has one of the best collections of original half-timbered houses in all of Germany because it avoided bombing during the wars. Thanks again for the post! It definitely made it really feel like Christmas just reading it! I’m always a little bit envious of those cute little European towns with so much history. There’s nothing quite like Christmas in a town like that! I’m sorry to discover this post so late. So far I’ve visited only the Munich Christmas market. 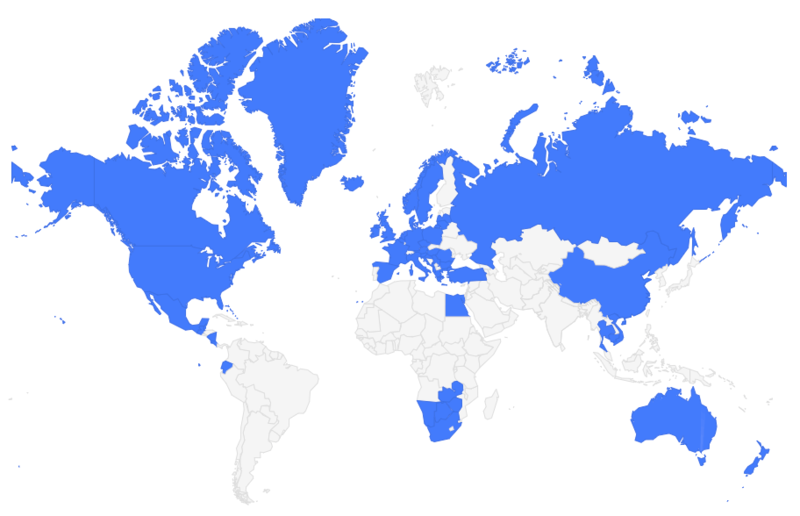 But there’re so many and I can’t miss them! The page is already bookmarked, and the next season I’m heading to Germany for Christmas markets experience.